1: Any artifact cast by any player gives you 1 life. 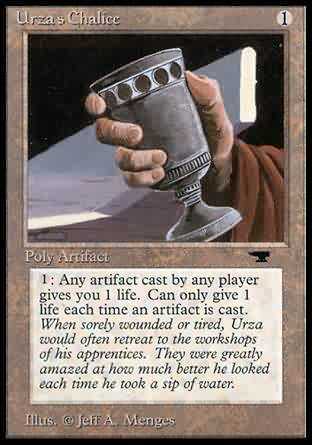 Can only give 1 life each time an artifact is cast. Whenever a player plays an artifact spell, you may pay 1. If you do, you gain 1 life. When sorely wounded or tired, Urza would often retreat to the workshops of his apprentices. They were greatly amazed at how much better he looked each time he took a sip of water.